Buffalo, NY According to mayor Byron Brown, who was joined by Braymiller Market owner Stuart Green, and Ciminelli Real Estate Corp. president and CEO Paul Ciminelli, Braymiller Market, a historic Hamburg market known for fresh produce, specialty foods, and seasonal plants, plans to open a new store as part of the 201 Ellicott Project. 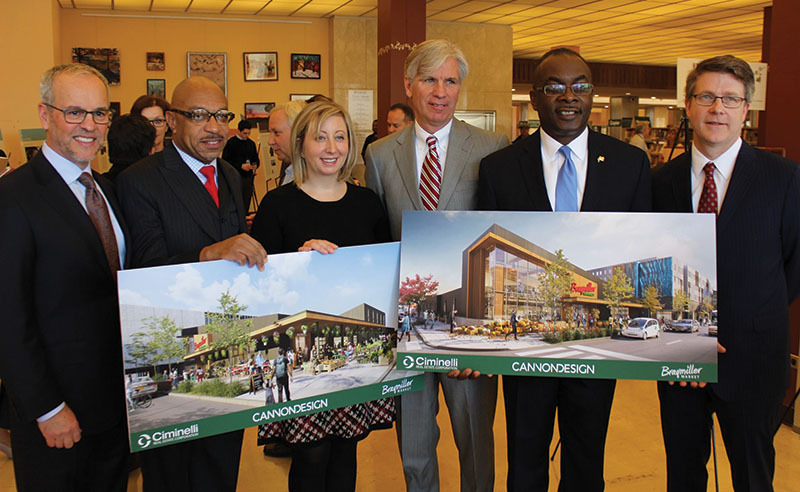 The fresh-food market is a key component of mayor Brown’s affordable housing project planned for Ellicott St., between the NFTA bus station and the downtown library. Mayor Brown said Braymiller Market will create an estimated 65 job opportunities for city residents, and give residents and visitors a new choice to buy fresh produce and specialty food in an urban environment. Stuart Green recently signed a letter of intent with Ciminelli Development to build, and ultimately own and operate, the fresh-food market. “This is a long-awaited addition to the downtown core, and an exciting one at that. Not only is Braymiller Market a solid, long-standing Western New York business, it also brings a relationship-centric philosophy that makes it a perfect fit for the city of Good Neighbors,” said Ciminelli. “Stuart Green and his team are emphatic about understanding customers’ needs, to ensure that the market continually surpasses expectations through quality products and service.